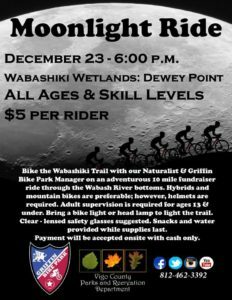 Bike the Wabashiki Trail with our Naturalist and Griffin Bike Park Manager on an adventurous 10-mile fundraising ride through the Wabash River bottoms. Hybrids and mountain bikes are preferable; however, helmets are required. Clear-lensed glasses suggested. Adult supervision is required for ages 13 and under. Bring a bike light or head lamp to light the trail. Snacks and water provided while supplies last. Payment will be accepted onsite with cash only, please. Decorate your bike with red & green. The best bike decorations will receive a gift certificate for a free weekend stay in our campgrounds.